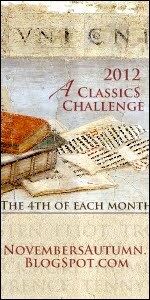 A Classics Challenge hosted by Katherine of November’s Autumn is underway. The plan is to read, and write about, seven classics in 2012. I’m reading The Great Gatsby by F Scott Fitzgerald. Enough to place him. But I don’t want to think about the author too much as I read, I want to focus simply on the book. When I’m done though, I would like to read more about the man and his milieu. Any recommendations? I first encountered Fitzgerald when I was fourteen. I was at school, exams had finished but there were still a couple of weeks of term left. The weather was warm, nobody was too inclined to study, and so our English teacher decided to show us a film of a classic novel. I’ve no idea why she picked that film – we had been studying D H Lawrence and Thomas Hardy – I can only assume that she had a limited choice, or that she particularly loved the film. I fell in love with a period, a style, a world I hadn’t know existed. And then I put him to one side. Until a few months ago when I began thinking about rereading some classics. And I thought Fitzgerald should go on the list, that I should see if he really was that good, or if a shy, small-town teenager has simply been bedazzled. The Great Gatsby is a small book and it would be easy to race through the pages, but I am deliberately taking it slowly and giving myself time to think. Off topic I know but I have just seen the film ‘Midnight in Paris’ and from your comments about the era I think you would really enjoy it too. Don’t want to spoil the plot! 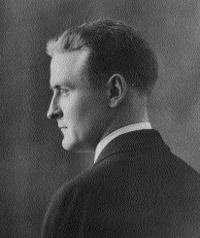 I have read and enjoyed a few of Scott Fitzgerald’s novels too. Midnight in Paris is very good and so is The Great Gatsby. I would like to reread it this year also. Have you heard about the new film adaptation coming out Christmas 2012? Leo DicCaprio plays Gatsby. 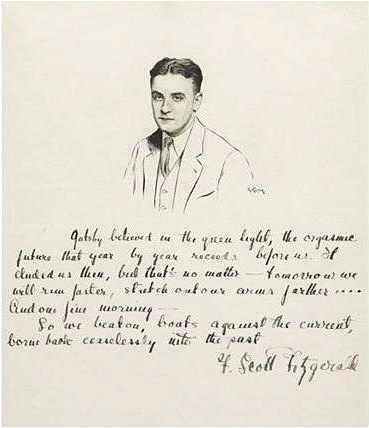 I think Fitzgerald the man is very well revealed in his letters, especially those he wrote to his daughter Scottie. And of course there is the biography of his wife Zelda by Nancy Milford. Hemingway’s A Moveable Feast shows Fitzgerald in Paris in the 20s athough I find Hemingway the most unreliable of narrators when it comes to Fitzgerald. Fitzgerald’s mistress after Zelda’s institutionalization, Sheilah Graham, wrote a book about her years with Fitzgerald when he was writing in Hollywood and drinking himself to death. I can’t remember the title of that one though. I’ve not read this book, but have his Collected Short Stories. You definitely get the feel for the era-the ‘jazz age’- from his works. Fitzgerald is one of those authors who seems to have passed me by. I have Gatsby lurking on my shelves though, so perhaps this will be the year. The author certainly sounds fascinating enough. I had to read this at school and I am afraid to say it put me off for life and I really do not know whether I could read it again. I have not read any of his other work so perhaps that is the place to start. Has been a long time since I read The Great Gatsby and that was the only Fitzgerald I’ve ever read and I can’t even remember whether I liked it or not. Maybe time to try him again. I too am savouring my reading this month and taking my time – especially with Mr Hardy which I’m loving. My love for The Great Gatsby is endless, it’s my favorite novel! I hope you enjoy it! I’ve heard many good things of The Great Gatsby and am looking forward to the new film they’re making. I know very little of him and hadn’t realized he wrote so few novels but am delighted with the idea of short stories as I plan to read more of them this year.